The KERAMION, Lost and Found: A Journey to the Face of God finally REVEALS what the other thousand Shroud books listed on Amazon.com can only "talk" about! * I dare say, most, if not all, of the listed Shroud books invariably discuss the early history of the Shroud in Edessa and likely mention the "Image of Edessa", the Keramion, an oil lamp and the concealment and discovery of these three objects in c. AD57 and AD525, respectively. These particular events are integral parts of the Shroud's early history. However, what these other listed books can only mention, The KERAMION, Lost and Found: A Journey to the Face of God actually REVEALS from a personal onsite investigation! The KERAMION book is completely NEW and UNIQUE, with important original discoveries surrounding Early Christianity! I had the distinct privilege of visiting Şanliurfa, Turkey (then: ancient Edessa) in May 2002 with my guide and translator, Hafize; and I was blessed with several new discoveries. The findings presented in The KERAMION are the result of many years of dedicated research, countless image comparisons with numerous testing and peer-review. Come along and join us on this adventurous Journey to the FACE of GOD. It crisscrossed Turkish terrain, language barriers, ancient cultures, and with pitfalls and wonders at every turn. We approached each day with open minds while remaining focused on our mission. As you join this journey, be sure to keep your eyes, ears, mind and heart open...and you also may just find, perhaps, what you have been seeking all your life...the TRUTH. 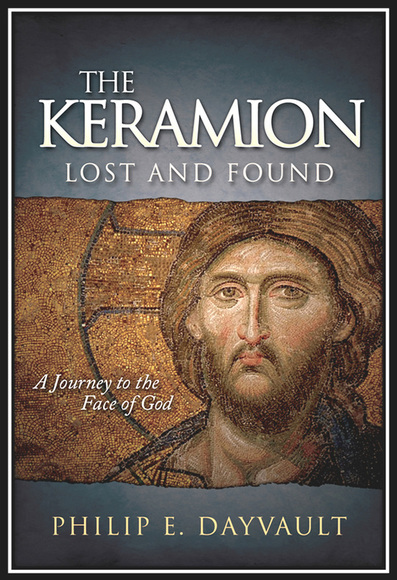 The KERAMION, Lost and Found: A Journey to the Face of God is published by the Morgan James Publishing Company, a highly-respected publisher headquartered in New York City. The KERAMION is available in paperback and eBook formats for ONLINE ORDERS from Amazon.com and finer bookstores everywhere, such as Barnes and Noble, Books-A-Million, Chapters, Powell's, etc. The KERAMION and selected photographs and collections will also be available SOON for ONLINE purchase directly from this website (www.keramion502.com). Personally signed book copies by the author will be available, upon request. The KERAMION makes the perfect gift for your loved ones and friends, as well. Dr. Jerome R. Corsi, Senior Staff Writer at WND.com, the world’s largest Christian website, published a review article on my new book, The Keramion, Lost and Found: A Journey to the Face of God. Dr. Corsi is a six-time New York Times Bestselling author. His review article, "MODERN-DAY 'INDIANA JONES' LINKS SHROUD to 1st CENTURY'", was published on March 23, 2016 on WND.com. You may see his article by clicking HERE. On May 20, 2011, I was interviewed by Fr. Dave Dwyer of “The Busted Halo Show” on SiriusXM129 Radio regarding my then-new article, “Face of the GOD-Man.” The article eventually evolved into my new book, The KERAMION, Lost and Found, which is now available for online orders at Amazon.com or via your favorite bookstore. It is imperative that people everywhere begin and continue to pray for this nation, its leaders and its national direction. “If my people, which are called by my name, shall humble themselves, and pray, and seek my face, and turn from their wicked ways; then will I hear from heaven, and will forgive their sin, and will heal their land.” - II Chronicles 7:14, KJV. 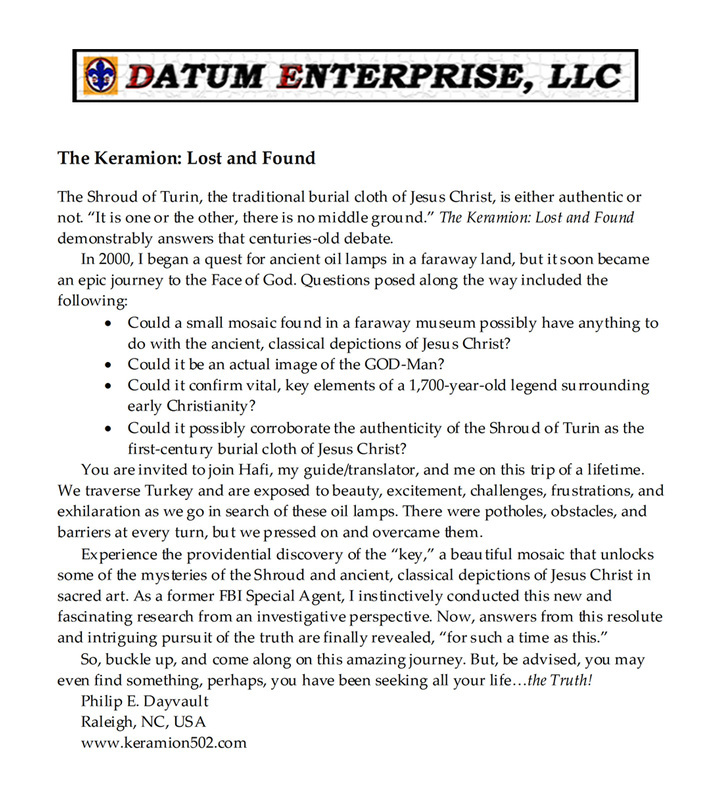 The Keramion, Lost and Found: A Journey to the Face of God, contributes a vital message in these troubled times. The author, Phil Dayvault, has written numerous articles, papers and webpages citing the reference of Eusebius, the fourth-century Jewish historian and author of “The History of the Church”, “Historia Ecclesiastica.” Since college days, Dayvault has known Eusebius was a fourth-century Jewish historian and has written as such on many occasions. However, due to an oversight by Dayvault, Eusebius was listed in the book, on page 266, as a “third century historian.” Fortunately, Eusebius is also listed properly as a fourth-century historian elsewhere, on page 216, in the book. Also, on page 119, the sub-heading, “Geographic Features of Şanliurfa”, should have been, instead, formatted as the caption for the previous photo on page 118. On page 142, "vermiculatum" is misspelled in its first entry. Many thanks are extended to the reader for overlooking these slight, but human, errors.